LUMBERTON, N.C. — People who live on the south side of town say they know where most of the flooding came from during Hurricane Matthew in 2016: a railroad underpass that intersects Interstate 95. 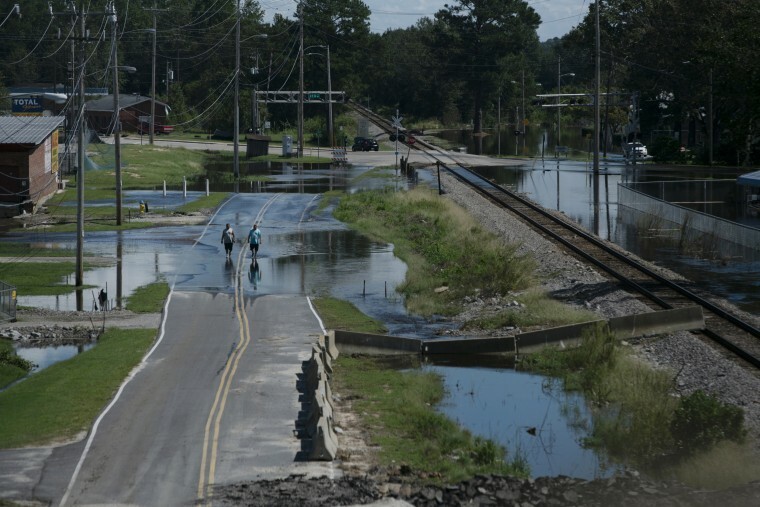 The underpass lets the railroad tracks owned by CSX run straight through the town's protective levees, and locals knew water would rush through there again once Hurricane Florence bore down on this region of North Carolina’s Inner Banks, because nothing had been done to stop it. Town leaders have long wanted a permanent solution, such as a floodgate at the underpass, which a study released in May concluded would save about 2,000 buildings and $232.6 million for a Matthew-equivalent flood — a more than 80 percent reduction in damage. Last week, with Hurricane Florence approaching, local officials hoped to at least cover the hole in their levee system with a temporary berm — a raised barrier built of sand and rock — before the storm. The problem, according to local officials, was that CSX would not allow anyone on to their property to build it, despite Florence’s dire trajectory. A CSX spokeswoman, Laura Phelps, acknowledged that Lumberton officials had approached the company about building the temporary berm, but she said the line needed to remain open to move hazardous materials out of the flood zone. "As we prioritize those shipments for the safety of the community and make sure there’s nothing in the path of the storm, we’re also balancing requests of bringing equipment in," she said. "We had a request from the National Guard to transport rescue vehicles into the local bases. We're balancing all of that." It was only on Friday morning of last week, with an order in hand from Gov. Roy Cooper, a Democrat, that Britt was able to organize more than 50 people via Facebook to fill sandbags and build a berm. Members of the National Guard and government workers from the area chipped in to help, moving more than 5,000 wet sandbags and rocks as they were buffeted by tropical storm winds and pelted by rain. Though the berm ultimately failed, North Carolina Secretary of Transportation James Trogdon told NBC News that it still helped lessen the devastation in areas that saw extensive damage after Hurricane Matthew in 2016. "The assessment locally is that it helped mitigate the flooding in West Lumberton and allowed evacuations to continue," said Trogdon. "So that's one of the things we’re going to look at when we repair I-95. ... Are there things we can do for future mitigation? Floodgates would be one of those." This low-lying area is protected from overflowing of the Lumber River by a series of levees that were built in 1977. But one weakness in that armor is the rail underpass that intersects I-95, through which CSX runs its trains and the Lumber River delivers its excess water. Local leaders claim the company has not participated in discussions over how to mitigate future flooding disasters, though the company says they haven't attended meetings because plans weren't clear enough. The addition of a floodgate was recommended by the state in the May flooding report, and the North Carolina Floodplain Mapping Program had already noted the underpass as a point of contention during the levee’s accreditation in May 2003. "In discussions with FEMA it was determined that the levee should not be considered to provide protection,” the report said, citing the breach created by the underpass. Despite an offer from North Carolina Emergency Management and the Golden LEAF Foundation, a nonprofit created in the late 1990s after a large tobacco industry settlement, to provide all the funding for the estimated $3.5 million floodgate, CSX continued to slow the process of its construction, town leaders said. "The holdup is that we don’t have permission from the railroad to get on that property and do anything," said Lumberton Mayor Bruce Davis. Only the governor has the authority to force CSX to participate in building a permanent floodgate, he noted. "They’ve never been a partner,” Davis said of the Jacksonville, Florida-based international railroad company, adding city officials have been told multiple times that CSX would consider anyone attempting to stem the flooding from the underpass as a trespasser. Brandon Love, Lumberton's city planner, said CSX had threatened to sue anyone who tried to place sandbags across the underpass. Further, he added, CSX did not show up to meetings to discuss the building of a floodgate to protect that part of the city as recently as a month ago despite promises that it would. Phelps, the CSX spokeswoman, said she was unaware of any threats to sue. "I know there are some claims out there that we were adversarial, that we threatened litigation," she said. "We don’t know of any threats to them. I don’t know who made those threats." She also said company representatives didn't attend the meeting because the city had not provided a clear plan. "The public projects team expressed that we would need to see formal proposals and plans to respond or comment on it. They [officials in Lumberton] were still in early planning stages. When we didn’t get any project plans or developments in front of us, we didn’t attend any meetings because we had nothing to contribute to the conversation yet," Phelps said. As for her claim that the company kept the rail line open because it was bringing in equipment for the National Guard, Lt. Col. Matthew Devivo, of the North Carolina National Guard, said: "We have no knowledge of anything going by rail. We put no plan in place to keep the rail line open." According to the CSX spokeswoman, the rail line wasn’t closed until the last moment, but the North Carolina Department of Transportation said their records show that CSX officially closed its line on Thursday, a full day before the governor issued an order to build the temporary berm and volunteers were forced to work in hazardous conditions. As the debate persists after another natural disaster, the community continues to suffer, with many losing their homes a second time after they had just returned to them after Hurricane Matthew's devastation. Kelvin Thompson, 31, lives within a quarter mile of the underpass in the south side of town, a predominantly black neighborhood that struggles with high rates of poverty. Thompson’s mother lost her home again in Hurricane Florence. He just moved into his home in January after more than a year without a steady residence. Now it's surrounded by water, and mold is beginning to appear on the back of the house. "[CSX] apparently don’t want it done, so I don’t know if we can stay here," Thompson said of the plans for a floodgate, as he leaned on a broom staring out at the water surrounding his home. "I like the neighborhood, I like the neighbors, it’s a convenient area, but they don’t have that area fixed," he said. "They got to put something there to try and stop all that water. They had the money to get it fixed, but they didn't do nothing."